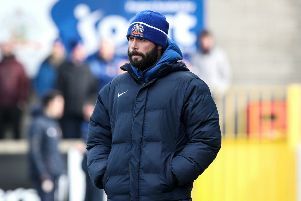 Glenavon rode their luck before an Eoin Bradley hat-trick secured a 3-1 win over Ballymena United at Mourneview Park on Saturday. It was the second time in the last two meetings Bradley bagged a treble against the visitors, but goalkeeper Jonny Tuffey was my man of the match as he produced a string of crucial saves including a penalty to keep his side in it. If Ballymena had any fears of coming to Glenavon it didn’t show as they made the better start. The visitors deservedly took the lead on 12 minutes when Allan Jenkins crossed from the far side, Matthew Tipton nodded the ball on and David Cushley gave Jonny Tuffey no chance with a close range header. The home side were fortunate not to fall further behind on 21 minutes when Jenkins was unmarked to get on the end of a corner by Cushley but his weak shot went straight to Tuffey. Then a mix-up in the box saw the ball break to Jenkins but Tuffey dived to his left to make a fine save. Glenavon broke at the other end and Andy Kilmartin was lurking at the edge of the box and as the ball broke to him his half volley flew just wide. Slowly Glenavon were beginning to get into the game and they drew level on 41 minutes. Neill did well to challenge for the ball in his own half, the ball broke to Braniff who turned quickly and sliced the ball wide for Hall who ran on and spotted the run of Bradley and delivered the perfect cross for the Glenavon striker to guide in. The home side made a much better start to the second half but Ballymena always looked dangerous and Cushley almost found the net again but his first time shot flew inches wide. Then Tuffey took centre stage for Glenavon. First he made a brilliant save to deny Shelvin, the ball broke to Tipton whose shot hit Kilmartin on the arm. Referee Raymond Crangle awarded the penalty and booked the Glenavon man. Tuffey came to the rescue as he dived to his left to save Cushley’s well struck penalty on 62 minutes. United again looked the more potent on the break and the Glenavon goal has a few lucky escapes. But in a quick break Hall’s shot was blocked and the follow up by Bradley was saved. But Glenavon struck the front on 81 minutes. Hall swung over the corner and Bradley ran in to space to glance his header past a ruck of players and into the net. Two minutes later Bradley had the ball in the net again, this time from the penalty spot. It all came after a lovely move between subs Mark Sykes and Gary Hamilton, a lovely back heel from Sykes allowed Hamilton to spray the ball wide to Mark Patton and his cross hit the arm of Tony Kane - penalty. Bradley saw his spot kick-parried but ran iin to head home. Glenavon: Tuffey, Neill, Kelly, Dillon, Lindsay, Marshall, Bradley, Hall, Kilmartin, Buckley, Braniff. Subs: Patton, Sykes, McGrory, Hamilton, Lynch.